The West of Ireland Major Charity Golf Event will take place on Friday 28th March 2014 at Enniscrone Golf Club, Co Sligo. The format is a 18-Hole Open Singles Stableford competition for the ladies and gents. Pieta House, the centre for the prevention of self-harm or suicide, opened in Lucan, County Dublin in January 2006. Since then, they have opened five centres of excellence in Ballyfermot, Dublin 10, Mungret, County Limerick, Roscrea, County Tipperary, Tuam, County Galway, Bishopstown, County Cork and most recently Castleisland, County Kerry as well as an outreach centre in Dublin’s Finglas. Barretstown is a specially designed camp that provides Therapeutic Recreation programmes for children with serious illness and their families. Barretstown’s mission is to rebuild the lives of children affected by serious illness and their families. We believe that every child with serious illness should enjoy their childhood. 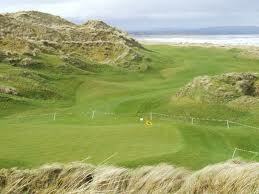 One of the great holes at Enniscrone! We hope some of you can make the event and look forward to seeing you on the day. Please contact Seamus with any queries regarding the West of Ireland Major Charity Golf Event on +353868061535. A Timesheet will be in operation.